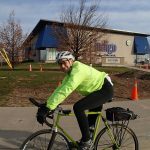 What a great start to the RO brevet season! 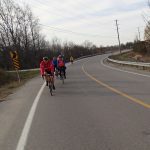 We had 27 participants on this ride, three new members – Randy, Peter P and Peter H, and two day riders – Alex and Bob. Alex obviously enjoyed the day because he is now an official member, having registered today. 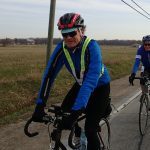 It may take a bit more convincing to get Bob Rotenberg out again in the near future on a brevet as he is still wondering why there were no restaurants, Timmy’s or places to purchase a hot coffee on this ride! Oh dear, I did warn people. The new members are all very strong riders, finishing in the first group with, you guessed it, Renato, Brian, William, Albert and Stephen, in less than 8 hours. To begin with, the day was not like a typical Gentle Start. The sun shone and the weather gods smiled on us until Maryhill, the furthest point north and east on the route and also the second control. Heading south the ride began to feel more like a true Gentle Start: the wind whipped up and the rain began at around 4pm for us in Campbellville. Riders who arrived back after this time were very wet. The wettest of all was Vaune Davis who did not bring any rain gear, but then she didn’t bring her cycling shoes either and drove back to the city to collect her shoes and start the ride 1 hour and 25 minutes after everyone else, thereby proving, once again, that she is gifted with superior powers of motivation, stamina and determination! Getting back to the weather report, there was none of the snow, sleet or hail conditions often experienced at this time of year and for that we were very grateful. 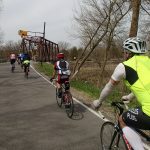 Many of us wore pink ribbons or jerseys on this ride to support one of our fellow riders, Bob Macleod, who recently lost his sister to cancer. Bob’s brother was there cheering us on in true marathon style, holding a big sign and shouting encouragement to riders at the roundabout in Cambridge. So great to see familiar faces again and good to see David Pearson returning after a brief one year hiatus from the club. In fact, funny enough, the last time the TO chapter saw David was on the brutal and legendary Gentle Start 2011 (pictured above)! 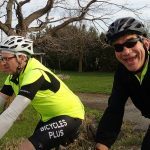 Thanks everyone for welcoming and supporting new and day riders and congratulations to Phil Piltch and David P who rode this 210 km brevet on their fixies! Hurray to be back on the road with fellow Randonneurs and to hear so many plans and goals for the upcoming season. We had nine riders on eight bikes as Peter and Peggy make another appearance with their tandem. With yet another Peter on the ride. I’m starting to think we should all change our names to Peter and be done with it. It was a windy, cold, and wet day. 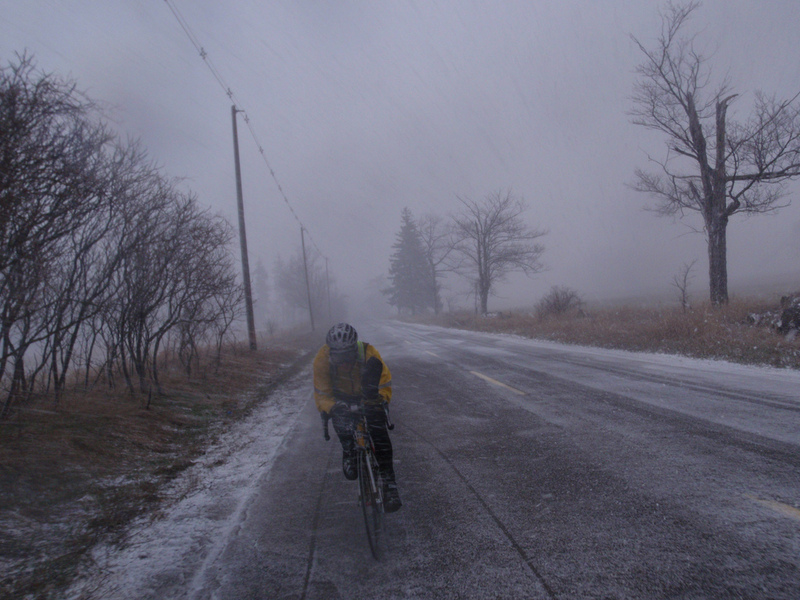 The weather included periods of Scotch Mist, drizzle, rain, and snow/ice pellets. Fortunately, the wind was from the “right” direction, giving us a nice tailwind for the trip home. Despite the weather and the somewhat desolate looking farmland, the scenery as we got into the Escarpment area makes the effort worthwhile. Small waterfalls trickled down the slope to feed the swollen rivers. The climb up Forks of the Credit Road, with its switch-backs and forested slopes is the highlight of the trip. As is typical for a Randonnuer ride, we had a closed bridge to cross. The multiple signs advertising “no exit” and “bridge closed” as we rode along The Grange and McLaren had us wondering if we would be forced to back-track. But, the bridge was actually in fair condition for cyclists, with an easily negotiated barrier at the north end. The Belfountain area was still feeling the after-effects of the winter storm that swept through last week. Many of the homes along the route had portable generators running and the air was filled with the smell and sound of chainsaws. The coffee shop in Belfountain itself was closed due to the power outage. Pressing on, we found a place at Olde Base Line and Hwy 10 that more than satisfied our appetites. After lunch, we rode through Lloydtown, which Robert tells me is steeped in the history of the Upper Canada Rebellion. By the time we made it back to Maple, the Sun was actually peeking out occasionally. Our newest member on the ride, Bashir, now knows why so many of us have fenders on our bikes. I wouldn’t be surprised if his wife made him shower with the hose in the driveway to get all the mud off. As Peter L., said, the ride was character-building. On Monday Feb 27, 2012, I was playing ultimate Frisbee with my best friend and the rest of our team, “Group 6”. That night I was running after the Frisbee as per usual and I felt what I thought was a soccer ball drilled in to my right calf, but there was no soccer ball to be found. My best friend said she heard a snap. The pain lasted less than a second, but it was extremely intense. After about a week of seeing various medical professionals, I found out that I ruptured my Achilles tendon. The surgeon said it would be 6 months before I could play ultimate again and 4 months before I could bike again. It was my right leg, so I could not drive anywhere. Ev drove me to and from work every day, otherwise I had to bum rides. Somehow I got the 4 month mark and the 3 month mark mixed up and started riding my bike outside early. I had freedom as I was still not cleared to drive a car. I was very careful about the whole process. I had been riding a stationary bike at home, with very little resistance. I was extremely gradual about increasing how long I would ride for and the resistance. 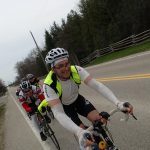 Eventually I built myself up to being able to ride 100 km the day before the Randonneurs Ontario AGM in September. I really wanted to give the first 200 of 2013 a shot as one can never know what happens on these rides. The forecast was for -5 ºC in the morning warming up to something like +3 ºC. I wasn’t sure if I should ride. I don’t like riding when it might be slippery. Luckily most of the roads have been dry around Ottawa, but I wasn’t happy enough with them to do many training rides. I barely made it to the start in time. There were a bunch of riders. I recognized some of their voices. I was busy getting stuff on my bike, no time for introductions etc. Colleen was nice enough to give me a control card. I got my stuff on my bike just in time before everyone started. The game of catch-up began right off the start. I was riding and my bike was making a very strange rubbing noise. I had to stop, only 10-20 m from the start. I didn’t see anything. I got back on my bike. I was in a very unfavourable gear for the chain, large front sprocket and large rear cog. That must have been it, as I shifted up the sound went away. I had just put a new wheel on the back, so I figured it was related to that. I caught up with the group and was happy to be there. Unfortunately my right pedal could not click in. I wanted to stay with the group, so I just kept pedalling with my cleat on the pedal. I was having a hard time staying with the pack. I found that one minute I was tired, the next I felt strong. The group was breaking up into two groups. I was feeling good. 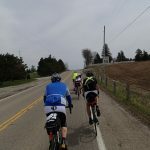 Pre-PBP 2011, I wanted to train to go faster, so I would jump on the wheels of the fast group and hang on for dear life for as long as possible, realizing that I would “hit the wall” hard later. This time, I got to the front of the slow group and pretended to be trying to catch the fast group (as they pulled away). As I passed Vytas, I said “this will be the only time this season that I will be able to do this, so here I go”, jokingly. Then with a smile on my face I joined Vytas at the front of the slow group. My gig was up. Of course there was no way I could keep up with the fast group. I have zero endurance. My left leg was fine, however, if you saw me at the gym, you would see that my right leg was practically missing a calf. That is how much I had atrophied. I enjoyed being at the front with Vytas. It was fun chatting. Eventually I went behind the group and try to figure out why I couldn’t click in on the right side. Whilst riding, I took my right foot off the pedal and feel if anything was obstructing my cleat. No luck. I could not find anything. I tried a few times at clicking back in. Again, no luck. I was falling further and further behind, so I decide to give up on that and re-catch the group. At some point I caught the group where we had to cross a major highway. I couldn’t resist, I said to Alain, “so this is what this place looks like during the daytime”. Alan laughed, because often on our longer rides during the night we are in the same place but coming back to Ottawa. I chatted for a while with Alan. It was nice. I told him about my cleat and he mentioned that sometimes the pedal mechanism just gets stuck. So I figured I wouldn’t worry about it until tomorrow. My feet were cold at the 10 km mark, I also mentioned this to Alan and he told me something that works for him: he overdresses a bit in the torso and that tends to keep him warmer in the feet. I liked that idea and it seemed to help (I didn’t add any clothing, but I didn’t take any off during the day). We were a group of 5 riders: Vytas, Alan, myself, and two riders I didn’t know very well. One looked like he was in a race (very light bike, not carrying much) (Brian) and the other was riding a very cool classic bike with an internal hub (Nick). I should have introduced myself. At one point during the ride, Vytas told me their names, I think it was Brian and Nick, but I could be completely wrong. The very fast looking rider took a nature break. Eventually he caught up with us, I had to take one as well, so I pulled over. Then worked at trying to catch the group yet again. I really need to learn how to minimize the number of times I need to catch up. I re-caught the group again. Then I remember we turned right on highway 511. I always get a kick of the number for that highway, being a physicist and a spectroscopist. I was in the back and somehow I didn’t catch the last rider’s wheel. I think there was a slight headwind, but enough for me to not catch the group. I did have them in sight however. It was almost like a day of following a dangling carrot. I remember that we took a few turns. Luckily I kept them in sight. I remember we went through Balderson and I was thinking I would love to take a break and warm up my feet. Luckily I could still see the guys ahead of me and that kept me going. I was also reminiscing about the 100 km ride I did in the rain last September and the shopkeepers in Balderson being really hospitable. Eventually we hit some hills. I was still behind the group. I could see that one rider was struggling on the hills with the group. Who was it? Was it Alan (he had told me he had not ridden any hills)? Nope, this person was too tall. Was it the new rider, who had the internal gear hub? Nope, it was Vytas. Hmm.. Then the question entered my mind, was he struggling or did he just take it easy to let me catch him? When I caught Vytas, he picked up the pace a little. He was asking how I was doing and I told him that I lost the wheel on the 511 and the slight wind got me. We rode together for a while, which was nice. Then we hit the gravel section of the route. The gravel was really, really well packed. I was happy. There was a small stretch where it wasn’t packed down and I cautiously slowed down for it. Just before that I lost Vytas. I caught Vytas again shortly after the gravel. Maybe he was waiting for me again. We got to the checkpoint in Maberly. The coffee shop was closed. I was hoping to have a bagel or something. No luck. The little shop at the end was open, though. Truth be told I love this place. I remember once I was on a long ride in the middle of the night and was running out of water and this place saved me. I really mean to go back to that restaurant for supper one day. When Vytas and I had arrived and the rest of our group was still there, snacking, strangely outside. I say strangely because it was a bit cold, but I guess it is colder on the bike or maybe it was warming up slightly. I got a Poweraid and noticed that I didn’t drink much during that first segment. I should have been drinking more. I remember that my mixture of Ensure and water was becoming this strange slush at the top of the bottle. Strangely the Poweraid that I brought from the start was not frozen. I had one bite of my Kit Kat and the group was off. I threw my Kit Kat in my pocket and played catch up again. It seemed like the racer guy wanted to set a higher pace so our group broke up in to 3 groups. Racer guy in front, alone. Vytas, Alan and the guy with the hub together and me off the back. On the occasional hill I would catch the group and stay with them for a while. I remember we had one really steep hill. I could really notice the difference between my “good” left leg and my recovering right leg. The right leg was suffering from lactic acid buildup. I could feel the burn in it. I could hear my physio asking me, “We need to review what you are doing to strengthen your quad and calf on the right side.” At one point I could feel a bit of a cramp coming on, I decided to drink Poweraid right away (I am not sure how much potassium is in my Ensure mixture) and I felt the results right away. I realized how much I missed my fast-twitch fibres which helped me climb. Actually I am sure I missed my slow twitch ones too. I remember catching the group at one hill and talking to the guy with the internal gear hub. I really should have chatted with him more because one of my other bikes has one. He told me he was having problems with one of his gears. I tried to rack my brain to see if I could figure out anything to help him. I couldn’t think of anything, because I have never taken the gear mechanism apart other than just to change a flat tire. Before descending down the Westport hill, I remember I lost them. I was alone. 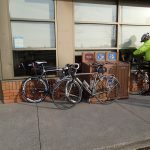 I wound my way through Westport and some cyclists at the Esso station called out. I thought they were on the ride. They told me they weren’t. I explained that I was trying to catch the other group. I told them quickly about the ride and about Randonneurs Ontario and left. I was feeling worse and worse as I approached Newboro. I was hitting the wall hard. I ate another banana at one point and that helped for a bit. But I knew that I really needed a sit down meal; pasta would be optimum, but fish and chips will do. I got to the check point and I was a little out of it because I didn’t know where the restaurant was. The group I was with were all there snacking on cookies. I knew that wouldn’t do it for me. I told Vytas I had to go to the restaurant. He warned me that it would be slow. I didn’t mind as my goal was to finish, because I was still recovering from an injury. My goal was not to set best time. I wished the riders a good ride and go into the restaurant. The restaurant was very, very upscale. I felt very awkward, but they were willing to serve me. Luckily I had checked out the menu on line beforehand. I knew what I wanted, before the hostess sat me, I asked her if they have fish and chips. She said yes, so that was what I was having. Strangely I don’t remember ordering, and hoped my order got placed. I also got some chocolate milk and they brought me cheese sticks. Normally I do some stretches as I wait for the food, but I called Ev and told her my status and then my food came. It was faster than I expected. I feasted and asked for the bill. I used the facilities and left. I was feeling like a new man. I stopped at the store looking for Poweraid. No luck. I got on the bike and after a while I was tired again. I eventually remembered that meals like fish and chips or burger and fries tend to make me tired once I get back on the bike. I really should have had a coffee with lunch as well. I was feeling a little discouraged, but tried to encourage myself. 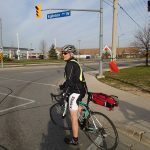 I remember that last weekend I rode 100 km alone (on two different bikes). I was not feeling great, but slowly the 10s of km were adding up. I had noticed that on the cue sheet that one of the turns was at a MacEwan’s gas station, so it was no big deal if I didn’t get Poweraid at Newboro. I was not sure if I should drink the Ensure mixture. Mixtures like this when it is warm out can give some ugly side effects. I remember from the RM1200 that someone had some problems with it. However it was colder than a fridge outside so it really should be fine. I was thinking I would avoid it and maybe dump it. I can’t remember if it was Toledo or Philipsville. (Many thanks to all of Peter’s hard work on the new cue sheets.) I checked and it was Toledo. There was a small gas station there. I bought a Gatorade. At first I nearly bought the 20 calorie one and then asked the store clerk, is there one with more calories. He said “More calories?? ?”, “yes.” “The one at the end” I said “yes I don’t think 20 will do it” and bought it and wished him a good day. I actually did drink the remainder of the ensure mixture and it seemed fine. I continued on. I saw that Kitley line 5 was gravel. My next turn was on Kitley line 3. I hope it wouldn’t be gravel. I remember on a different ride that Bill “the pedal nut” hated the gravel section, for some strange reason I felt it was near here. I got to Kitley line 3 and it wasn’t gravel. I was happy. There is only so much gravel one can take. I was trying to plan ahead. I decided that I didn’t need to stop at the MacEwan’s Gas station and that I would have a very short stop in Merrickville. I figured I would just go to the grocery store and buy a Coke and a Poweraid. I thought a Coke would be kind of cold and I might not have a space for it on my 3 water bottle cages (some drinks were half finished, etc.). Then I remember the coffee shop. I didn’t want a coffee because I can’t drink coffee hot, I have to wait for it to cool. So, I didn’t want a regular coffee, however an espresso would cool faster and give me the kick I needed. I got to Jasper. Yes Jasper, Ontario. I have a few good memories of riding there with Jim Morris. 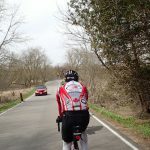 I was reminiscing about how he took a picture of me near the sign and I imagined the caption “This is not the Rocky Mountain 1200, this is the Ontario Flèche”. I also remember how he sent me a news clip about a local business in Jasper, Ontario which was pole dancing lessons. Then I realized that I was on county road or highway 16. I thought “OK that is too funny. Someone definitely had a sense of humour.” I was thinking this because, the Trans-Canada Highway between Edmonton, Alberta and Jasper Alberta is Highway 16, the Yellowhead highway. I was guessing that Jasper, Ontario was named after Jasper, Alberta. Once I got home, I tried to look up the history of each town, but I could only find that Jasper, Alberta was established in 1813. I got to Merrickville. I decided to go into the cafe. I opened the door and I saw the espresso machine. I was practically drooling. I ordered a double and thanked the girl working there. Then I went into the grocery store and got a Poweraid. As I waiting in line the customer before me was talking to the cashier about a play that the cashier was acting in. I bought the Poweraid and wished the cashier luck with the play. I guess I was still buzzing from the play I saw on Thursday night. It was called Merz. Anyway, I got on the bike and got going. I felt 100 times better. I thought it was the espresso. For 20 km of the 40 km to go, I felt great. I guess I also felt great because subconsciously I knew the rest of the way home! I was thinking that I could definitely finish this thing, whereas at the 100 km mark, I was not sure. I got onto route 23 and was happy to be out of the traffic. It was good to be in a familiar place while riding alone. I knew that I would not get lost or go off route. I was sad as I rode through Burritt’s Rapids. I was sad because the store there had closed down a few years ago. We used to have a Populaire that went out there. 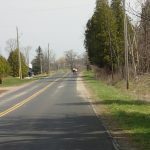 Then I got on Dwyer Hill road, I was happy because with about 30 km to go, I knew it was 27 km of straight to Flewellyn. At the 180 km mark or so, the coffee was wearing off. I was not feeling great any more. I had a banana in my back pocket, but I didn’t really feel like eating. I probably should have. I tried to stay as positive as possible as I struggled through the last 20 km. I was basically just watching the km count down. Just hoping I would not get a flat tire or some other mechanical problem. Eventually, I thought I was probably close to the turn but it was Fallowfield road and not Flewellyn road. I got to Flewellyn road and was in rough shape but happy that I knew that there was only 3 km. I got to the parking lot and my car was the only one left. I was happy I finished. I called Ev and made arrangements for supper. Just some extra notes on the ride, as per usual I brought way too much stuff. I had brought a lot of extra clothes that I didn’t need. (I wasn’t sure about the cold). My right hip was sore off and on, I am thinking it was either way too tight or an effect of the fact I was not clipped in on that side. Since 2007 I have been taping my shoulder and I didn’t for this ride. However, I probably should for the 300. The coolest thing though, is that yes I was slow, however I was only about 45 minutes slower than when I did this ride healthy back in 2009. My thanks to all who came out for the ride. It’s still early season and it was a bit chilly, but then this isn’t call “Ice Classic” for nothing. Many of the small lakes, including Musselman were still ice-covered, and there was even some ice over Leslie St where it curved around a small lake/pond. At least the sun stayed out until the afternoon, though the wind picked up from the southwest making the return less speedy. A special mention to Bashir who joined last month and completed his 3rd ride of the season.